Pink heart butter cookies. 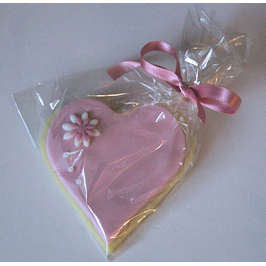 Another one of our popular wedding favours, is this beautiful heart shaped butter cookie. Each one can be elegantly embellished with flowers to match the theme of your wedding cake. A lovely companion to go on the table for all of your guests. The colours can be changed to match the theme as can all the decoration on the cookie. Our hand made cookie favours are available in a wide range of flavours. As we bake all of our own in house to our own recipe we can change most anything about them to suit. Add a hint of lemon or lime to the flavour. These gorgeous butter cookies are soft and just melt away in the mouth when eating. Change the colour of the ribbon around the bag to suit your theme. If you prefer we can provide them in boxes with 2 or 3 in each. An ideal gift for your guests at the table.